When our department was established, it was named Internet and New Media. However, we thought this title was too general. Also, New Media is a tool, another tool we have at our disposal to carry out diplomacy. We also knew that we needed to add the term diplomacy to our department’s name. There is cultural diplomacy and public diplomacy and our brand of diplomacy. We started looking left and right and found different definitions for this kind of diplomacy. Then I came across the term Digital Diplomacy and it suited my vision for the department since the term references the digital sphere in which we operate, a sphere that has a lot of potential. So you don’t view Digital Diplomacy as a new form of diplomacy but rather as a new tool in the conduct of traditional diplomacy? Yes. But as a tool, Digital Diplomacy has its own advantages and unique characteristics which have brought about a sort of conceptual shift. For example, the most important question in diplomacy is “how do you know that you’re being effective”? How do you know that a cultural event organized by an Embassy was effective? Do you measure the size of the audience? Do you analyze the reviews printed in the press following the event? It’s very hard to quantify diplomacy and its effect. But in Digital Diplomacy, you can set very clear objectives and measure whether you have achieved these objectives or not. What’s most important to us at the Ministry is engagement. One objective we set was to promote our Facebook profile in Arabic. We know we were successful in achieving this objective because we doubled the number of “Likes” on the profile. In addition, the number of comments on the profile was five times higher than before. Given the growth in comments we knew that we had reached our target audience- people who were active online and who wanted to get involved. So Digital Diplomacy enables you to define a target audience and examine whether you have indeed reached this audience. Another by-product of Digital Diplomacy is that it requires you to define your goal, your massage and your audience. Let’s say that you are part of the cultural unit at the Ministry and you want to promote Israeli culture. Where do you want to promote it? Amongst which audiences? What kind of culture do you want to prompted? So Digital Diplomacy also brings structure? Exactly. It forces you to define your audience and set goals. In our case, we operate under the assumption that some 25 % of people will never be receptive to our messages. There is also another 25% percent who needs no convincing and favor us no matter what. So we decided not to bother with these audiences and focus on the 50% in the middle, those who might be receptive to our messages. An important question is how do you reach your audience? One way is to virally distribute your messages. We begin by spearing these messages through the people in our department. Then we recruit our diplomats stationed abroad and our embassies. Then, these messages find their way to our embassies’ followers who distribute the messages to their own online communities. This way your messages find their way to different spheres of influence. On our side, it’s very demanding work since we need to provide interesting and relevant information to our followers, information that will evoke a willingness to share our messages even amongst audiences who do not traditionally align themselves with us. That’s the 50% in the middle. This is very important since the credibility of a private person may be much higher than my credibility as I am seen as an actor who has a certain agenda that he wants to promote. Digital Diplomacy has also brought much change to our work vis-a-vis traditional gatekeepers. Think about how dependant we once were on traditional gatekeepers such as newspaper editors in terms of getting our message across. Nowadays, we are much less dependent on them. For instance you can have a very successful viral campaign without bothering with going through those gatekeepers. Because if it successful online the gatekeepers will write about it anyway. And a big campaign gets a lot of press which may influence public opinion and then you enter the sphere of the policy and decision makers who are always attune to public opinion. Has the medium changed the message? Does Digital Diplomacy bring with it a new sort of message? No. The message hasn’t change. We have a new medium for delivering the message, but it’s the message that still counts. The medium influences how you get the message across, like a viral campaign, but the message itself has not changed. How do you define and measure engagement? In the case of our Facebook profiles, the obvious parameters are an accumulation of the “Likes”, “Shares” and number of comments.Also you have the “talking about this” indicator which tells you how many people are currently active in the discussion. The “talking about this” parameter also tells you something about your reach. The more people talk about you the greater your potential reach. But that’s just one kind of engagement. What about talking with your followers in the form of dialogue? That’s what we place our emphasis on, dialogue. But it changes in accordance to the target audience. It works very well on our Facebook page in Arabic. First, we attempt lo locate trolls who are just there to publish insulting posts. It’s important because we want to create a platform for open dialogue and such trolls sometimes hijack the conversation. Second, we place an emphasis on answering questions and proving information to those who are willing to engage in dialogue with us. There is a saying “people ask question, people change”. When someone asks a question, no matter how critical he is, there is an opening for an answer. If there is an opening for an answer, there is also an opening for change. Our Facebook profile in Persian is also very successful and popular. But in our Persian profile we try to be less visible. I want our followers on that profile to talk amongst themselves; I want them to view it as a platform for them to be critical about various issues. I want them to feel that Big Brother isn’t present. The Canadians did a similar thing launching a platform where Iranians can talk amongst themselves on matters that are important to them. How is Digital Diplomacy practiced at the embassy level? When we started operating at the embassy level an important question was what degree of independence are the embassies going to enjoy? Our spokesperson was very concerned since he would no longer controls all the Ministry’s messages. We don’t approve and oversee every post and tweet published by our embassies just like we do not accompany an Ambassador to all his meetings or screen every comment made by an embassy spokesperson. We give the social media directors at the embassy level a lot of freedom but no more than the freedom enjoyed by a press attaché. Who is the social media director at the embassy level? A diplomat? A local employee? Usually a local employee since he is familiar with language and the culture of the embassy’s followers so he is the best person to engage with them. The social media director is the one who tweets and posts on Facebook. Our department advises, provides information and oversees the activity in general. One final question- what’s the future of Digital Diplomacy? Where are we headed? In my vision, using digital channels in diplomacy will become the norm. It will be as natural as sending an email. The “new” media will no longer be new but an integral part of how we get our foreign policy messages across. It will also become an obvious tool for finding relevant information like Google. So if you work at our Greece desk, you will start your morning with going through emails, reading the newspapers and screening relevant tweets from Greek officials or tweeting “hey guys, what’s new in Greece?” to your followers. But (! ), the content will remain the most important aspect of diplomacy. Not the medium. As there is no one definition of Digital Diplomacy, scholarly work in this area would benefit from understanding how Digital Diplomacy is defined and practiced by diplomats “in the field”. Interestingly, in the case of Israel it seems that brick and mortar embassies have remained an important part of diplomacy, one that helps a nation spread it foreign policy messages. Moreover, embassies continue to enjoy a large degree of freedom. However, it should be noted that in Israel’s case, Digital Diplomacy at the embassy level is not practiced by a diplomat stationed abroad but by a local employee. This may enable greater engagement with followers but may also diminish the ability to tailor complex foreign policy messages to local audiences and asses the degree to which such messages are received. Lastly, it would appear that the definition of engagement has not yet realized the potential of engagement, as it is not the number of “likes” a Facebook profile receives that matters but the number of conversations taking place between MFAs and their followers throughout the world. 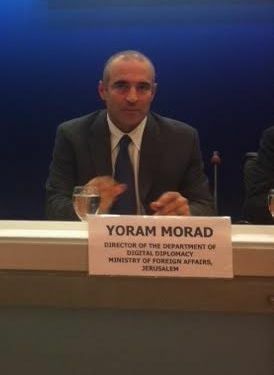 Yoram Morad adds: In addition to the social media director who uploads content to the digital diplomacy channels, diplomats also contribute to the content uploaded thereby enabling the ministry to include complex matter relating to foreign policy. Next week I shall be blogging about the actual reach of various foreign ministries and attempt to examine if they really have a global audience. Posted in Uncategorized and tagged Cultural Diplomacy, Digital Diplomacy, Facebook, Israel, Public Diplomacy, twiplomacy, Twitter. Bookmark the permalink.